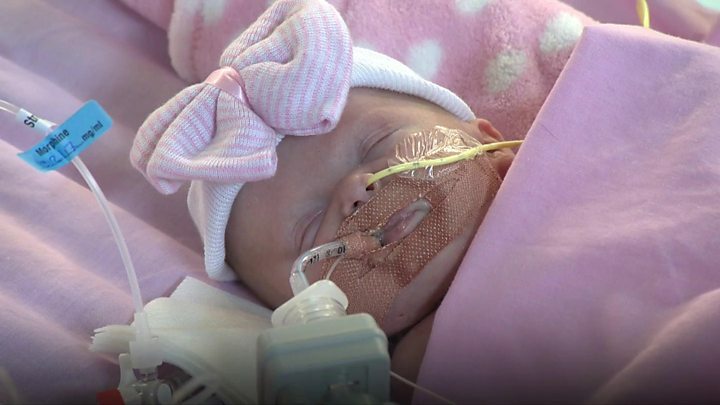 A baby born with her heart outside her body has been moved to a hospital closer to her home. Vanellope Hope Wilkins was born in November and has had three operations to place her heart back in her chest at Glenfield Hospital, in Leicester.The six-month-old was transferred to the Queen's Medical Centre (QMC), near to where the family live in Nottingham.Mother Naomi Findlay said she had "longed" to have her daughter in a hospital that was closer. "[Vanellope] is coming on in leaps and bounds... she's very feisty, she's also very vocal, if she's not happy she lets everybody know about it," she said. The family said the constant travel from Nottingham to Leicester had been hard, especially as they have other children. "It was tough," said dad Dean Wilkins. "You've got to look at all different things, if you're working, not working, if you've got the money or not. "Vanellope had the extremely rare condition, ectopia cordis, of which there are only a few cases per million births - most are stillborn.Glenfield Hospital said it did not know of any other case in the UK where the baby survived following an operation to place the heart back inside the body. Dr Meissa Osman, paediatric registrar, at Leicester Royal Infirmary, said the transfer to the QMC was "uneventful". "She slept all the way through so we're happy..." she said. "We're very proud to be involved in her care. "Vanellope was delivered by Caesarean section on 22 November in order to reduce the chances of infection and damage to the heart.There were about 50 medical staff present including obstetricians, heart surgeons, anaesthetists, neonatologists and midwives.She will need another operation to create a breastbone at some point in the future.